Sunshine Service Brake & Alignment is your brake repair specialist. Since 1947, we have been the experts in brake repair on your car, truck, SUV, and RV. We are located in Sparks, Nevada and provide our services to Reno, Spanish Springs, Sun Valley, Incline Village, Lockwood, and Fernley. We are locally owned and operated, and proud to be part of the community. The safety of your vehicle depends on having your brakes working properly. It is important to have your brakes inspected. We recommend you have them inspected every 10,000 miles, or every other oil change. A routine inspection can help prevent costly repairs down the road. It’s also important for the safety of everyone who rides in your vehicle. We are experts. We have made a name for ourselves with our expert technicians working on your vehicle. 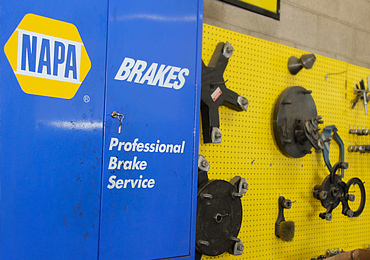 We are backed by NAPA, and carry their Peace of Mind Warranty on all our brake repairs. We will inspect your brakes, repair them, or replace them depending on the need. We will not recommend a service you do not need. It is important to be aware of the following symptoms, as they may indicate the need for brake maintenance. Drag – Are your brakes sticking? Are your brakes failing to release? This would indicate service is needed. Pull – Is your vehicle pulling to one side when brakes are applied? This could be due to underinflated tires, misadjusted brakes, or an indicator that you need brake repair. Hard Pedal – Do you need to push the pedal hard to engage your brakes? This can indicate brake trouble. Brake Light – Is the brake light on your dashboard lit up? It could be as simple as you have to release your parking brake. It can also indicate low brake fluid, and the need for a brake inspection. Vibration – Does your vehicle shake or vibrate when you apply your brakes? May indicate the need to have your disc brake rotors resurfaced. It may also be an indication of a more serious problem, loose components or faulty steering mechanism. Squeal – Are your brakes making excessive noise? There may be some noise when you brake, but anything excessive presents an issue. If there is any squeal, screech, grinding, clunking, or clatter, you probably need brake service. Low Pedal – Is your brake pedal nearly touching the floor boards before the brakes engage? It may need a simple adjustment, but could indicate something more serious. Grab – Are your brakes touchy? If your brakes engage with very little pressure, it could indicate a problem. It could be as simple as contaminated linings, or as serious as a loose or broken component. If your car, truck, or SUV is experiencing any of these symptoms, you could probably use a brake inspection.